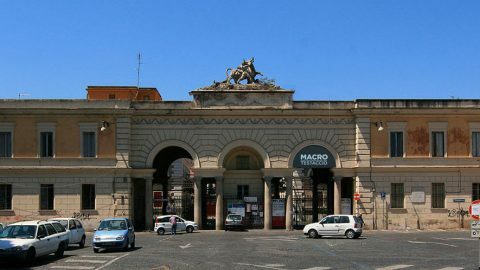 LPM 2018 Rome takes place at MATTATOIO, in Rome, a centre of cultural production located in Piazza Orazio Giustiniani 4. An area of 5000 square meters hosted in the Slaughterhouse and intended for exhibitions, educational activities and workshops. An example of industrial architecture, the result of an excellent restoration lasted more than three years, ready to become an innovative and flexible space that can host various events. The STUDIO 2 is suitable for presentations, shows, performances, conferences and parties. The stage have a big screen on back. The GALLERIA in the outdoor stage for performances and parties. The stage have a big screen on back. The FOYER 2 is a large space full of pipes of the slaughtery, ATELIERS are 7 single rooms and both hosts the installations. The OUTDOOR of Mattatoio is the perfect place for the Mapping artworks, with a very big facade made of classical shapes with a bull on top.